You have to admire people like Douglas Green, starting off as a student in Viticulture and Oenology, getting to know the good vineyards in the best areas and working in them and then deciding at a very young age to become a wine negociant. 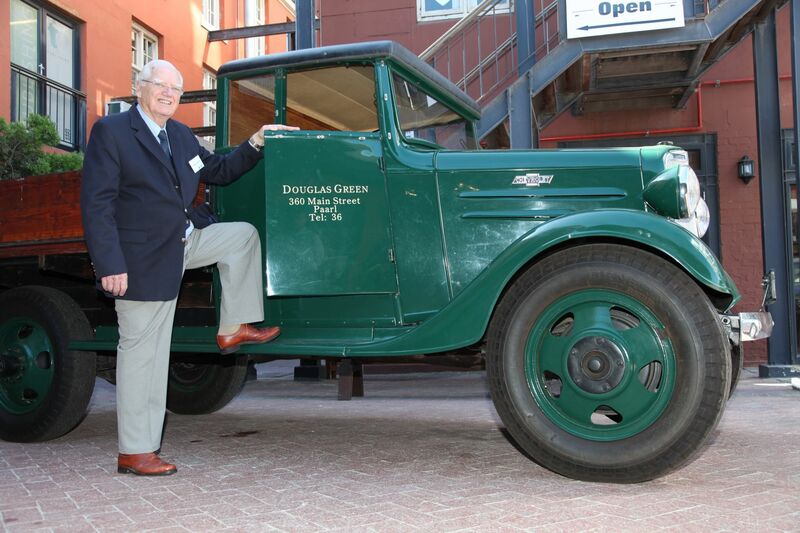 One of the early ones in the 20th century Cape, he started his company, Douglas Green Wines in 1942. He had predecessors and indeed successors, though he always knew his market and what his clients wanted – value for money, a good expression of the grapes used and a fingerprint of the vintage. 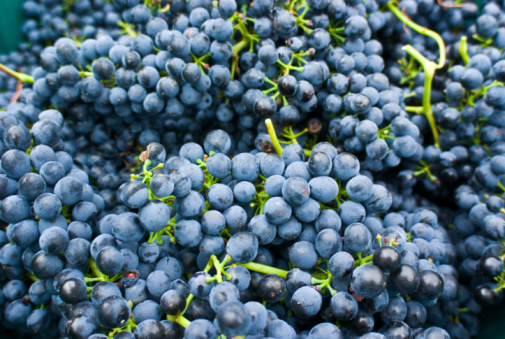 The grapes for the Douglas Green Shiraz 2017 were made into wine in local cellars in the Swartland and Breedekloof under the supervision of Douglas Green’s oenologists. The final wine is blended and bottled in the Douglas Green Cellars in Wellington. The dry winter of 2016 was followed by a hot dry summer. The grapes were chosen from the Swartland for the chunky tannins and fruit they would offer the wine. The classic fruit of the Breedekloof made up the other component. Once harvested, fermented and pressed, the Douglas Green Shiraz 2017 spent time on American Oak staves where malolactic fermentation took place. Further ageing of 3 months ensures the interweaving of the oak flavours, the tannins and the generous fruit. Bottled under screw cap in a Bordeaux shaped bottle with the amusing 1940s etching of Mr Green’s bakkie, seen above. In the glass, the wine is purple dark plum at the core which pales out to a youthful purple crimson at the edges. Black and blue berries and roadside brambles. Oak in undertow with its concomitant spices. The Douglas Green Shiraz 2017 is easily accessible for ‘now drinking’. A generosity of dark fruits, plums interwoven with ripe tannins which will soften for up to three years of careful storage. Good palate and ending, good food wine. Drinking well now and begs for food. Do chill it for about 30 minutes before service. While it will do your traditional Sunday Roast proud, it is a happy partner to a midweek supper. And, when well chilled can match a good fish dish. 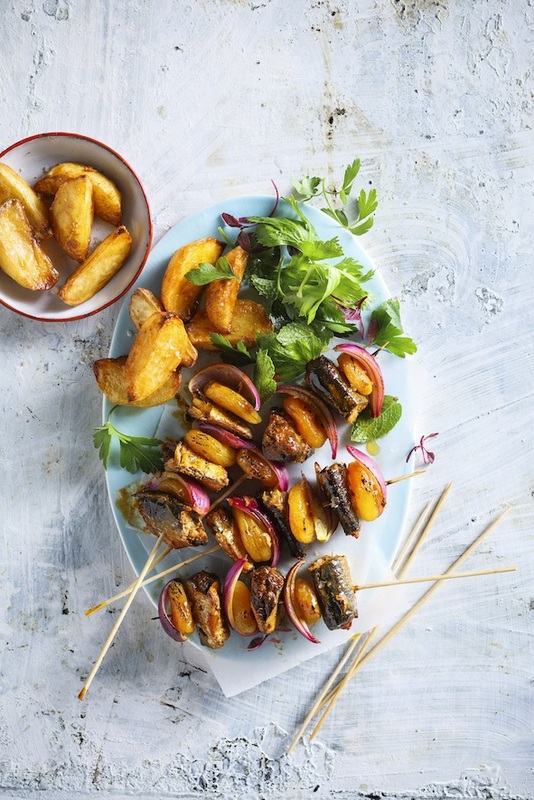 An oily fish like a pilchard, as shown in Tamsin Snyman’s Baked Fish Sosaties with Paprika Potato Wedges. 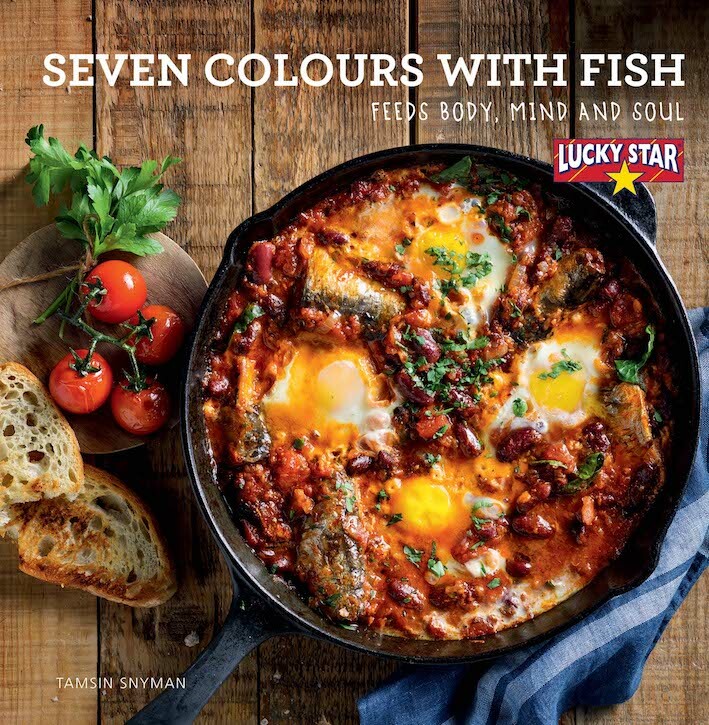 The recipe comes from her book Seven Colours of Fish. Drain the pilchards and reserve the sauce. Lay the pilchards on a plate or tray. Cut each fish in half to create 2 – 3-cm cubes. Mix together the marinade ingredients with the reserved sweet chilli sauce. Pour over the fish to marinate for at least an hour. Mix the oil and paprika together in a bowl and then toss in the potato wedges to coat evenly. Season with salt and black pepper. Lay the wedges on a lined baking tray. Roast for 20 – 25 minutes or until they are cooked through, golden and lightly crisp on the edges. To assemble the skewers, separate the onion pieces and pair with the apricots; allow for two sets of onion and apricot per skewer. Thread one set of onion and apricot onto all 12 skewers. Add a chunk of pilchard, followed by another set of onion and apricot, finishing with another chunk of pilchard. Place the finished skewers on a lined baking tray and place on the top rack of the oven above the potato wedges. Bake for 5 – 10 minutes or until heated through and the marinade starts to bubble. Finish off under a hot oven grill and brown for 2 –3 minutes. Pre-soak the skewers before using and be extra careful when threading the fish onto them as the pilchards can break apart easily.